Cruise to the Edge, the ultimate progressive rock cruise, is honoring the Bob Moog Foundation as the official beneficiary organization for its third annual Caribbean cruise. The music-based cruise, which sails from November 15-19, 2015, features renowned bands, ranging from legendary to neo-progressive rock acts. The progressive rock genre traces its roots to the early use of the Moog synthesizer, making the Foundations role in this years cruise a fitting tribute. The five-night cruise will feature multiple stages of progressive rock music from the iconic and GRAMMY-winning rock band YES, special guest Marillion, and 25-plus bands, aboard the magnificent NCL Pearl. A new addition to this year’s cruise itinerary is a special pre-cruise event, complimentary to all cruisers, on Saturday, November 14 in Miami (location TBA), before setting sail to crystal clear Bahamian waters, visiting Key West and Great Stirrup Cay, Bahamas. The special pre-cruise concert will feature performances from Martin Barre of Jethro Tull, Three Friends, and Lifesigns. Cabins on the cruise can be purchased through the Cruise to the Edge website. Cruise to the Edge enthusiastically supports the Foundations hallmark educational project, Dr. Bobs SoundSchool, and the Foundations archive preservation efforts, both of which bring science, music, and innovation alive for people of all ages. Two exciting opportunities will be available to support the Foundation during the cruise. First, the Cruise will hold a raffle for a legendary Minimoog synthesizer signed by a host of legendary progressive rock artists. Raffle tickets will be sold throughout the cruise and a winner will be drawn at the end of the journey. Second, a one-of-a-kind silent auction, replete with instruments, audio gear, historic memorabilia, and much more, will take place on the final day of the cruise. All proceeds from the raffle and silent auction will be donated to the Bob Moog Foundation in support of its projects. 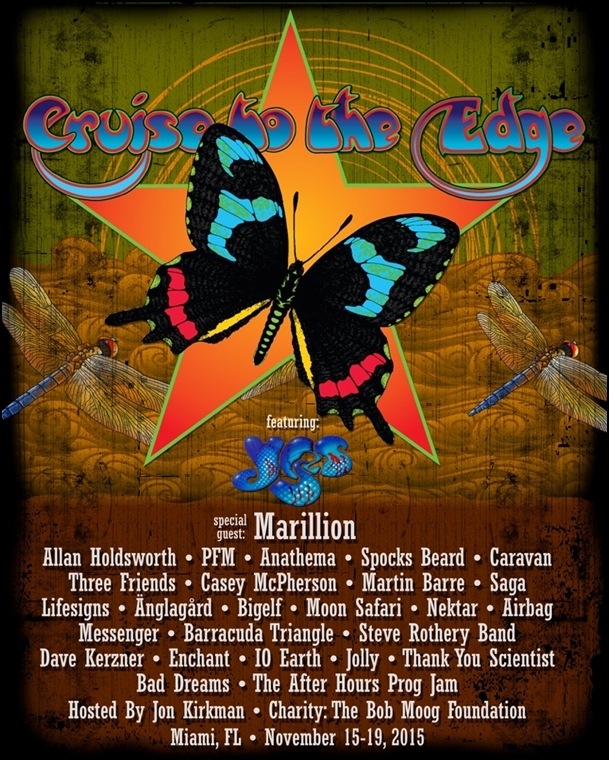 Legendary progressive rock bands YES and Marillion will lead an all-star lineup gracing multiple stages aboard this years cruise, including: Anathema, Allan Holdsworth, Three Friends, PFM, Saga, Martin Barre, Caravan, Spocks Beard, Nektar, Änglagård, Lifesigns, Bigelf, Airbag, Casey McPherson, Messenger, Dave Kerzner, Moon Safari, Barracuda Triangle, Jolly, Enchant, Thank You Scientist, Steve Rothery, Bad Dreams, AHEPJ, and hosted by UK journalist and preeminent YES expert, Jon Kirkman. CRUISE TO THE EDGE has been carefully designed to meet the discriminating requirements of the most avid music fan/cruise vacationer, producing a true fan and artist experience in a surreal and relaxing setting. Produced by On the Blue Cruises, CRUISE TO THE EDGE is a playground for the serious fan where music and a luxury cruise hook up for the vacation of a lifetime. A very fine charity… associated with a class act cruise. The artists… the patrons… the talent… aboard this ship… it’s astoundingly fun. What a perfect fit to have Bob Moog Foundation associated with CTTE, marrying a worthy cause to a high class music cruise experience.